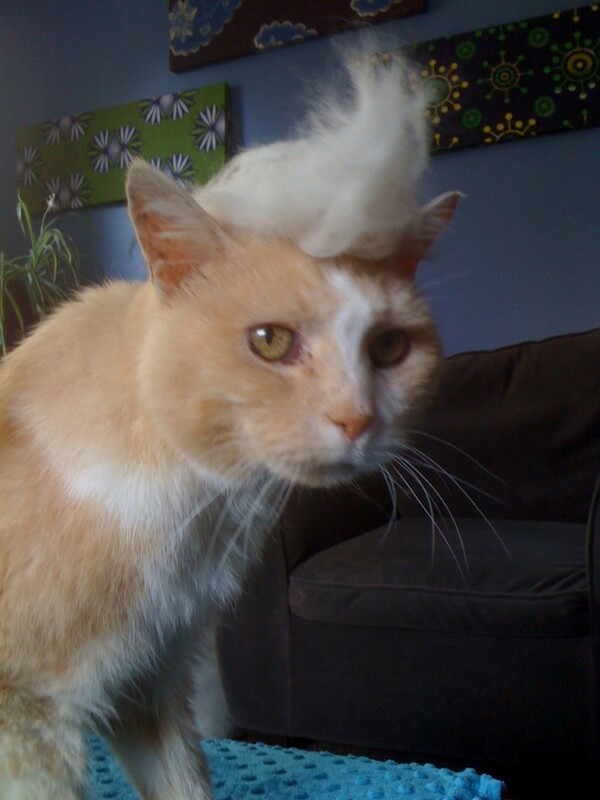 Posted on November 9, 2016 November 9, 2016 Categories cat fun, cat name, cat trivia, feline fun, indoor cats, Just for Fun, orange cats, senior cats, UncategorizedLeave a comment on Trump Cat!!! You never would have thought Luna, my strong willed little tuxedo girl, would live to her current ripe old age of 20. A few times in her life, Luna has endured some health setbacks, most of which have been related to intestinal problems. As a long time cat lover and specialist in their daily care and well being, I am often amazed by Luna’s resiliency when, with the proper care and nutrition, she has bounced back each time to live another day. Age 20 for a cat is a great achievement in and of itself, but this wily cat also enjoys “working out” at night, a routine typically followed by much younger cats. At the stroke of midnight, a few times a week, Luna leaps from the bed to the floor, races through the second floor of our home, and repeats the performance. Not a way for her humans to get a restful night’s sleep, but we can’t help but admire Luna for her pep. Observing the living habits of many older cats over the years, I have developed a sense of what is behind the phenomenon of cats managing to live to ripe old ages. Genetics certainly would seem to play a factor. Much like studies on human genetics and how their inherited traits may swing the longevity pendulum to a shorter, or longer life, I believe that this impacts cats’ lives as well. Some purebred cats, for example, seem to generally have a shorter life span than “mixed” breeds, the latter of what I term a “Heinz 57” cat. Although several years ago, there was a story about a Sphinx cat who purportedly lived to age 32. His human was also quite elderly, they were the perfect “little old men”! Exercise leads to fit cats, another indicator of longevity. Our Luna is about as slim as they get, and that’s the way she’s been for many years. Perhaps that’s why she seemingly has little to no arthritis and the ability to fly through the air at midnight. It’s important to spend as much time as possible interacting with cats. Catnip, wand and other toys that bring out the hunting instinct in cats are effective in ensuring exercise as well as mental stimulation. Although indoor/outdoor” cats undoubtedly experience the thrill of the hunt, they are subject to many more life threatening risks than their indoor feline counterparts, including hit and run car accidents, animal fights, and unfortunately, ill meaning people. Great nutrition is another leading factor. With the proliferation of cat food choices on the market, it’s easy to choose a food that has fewer by products, and purer ingredients. I have also discovered that moisture in food tends to be an important factor in a cat’s health, especially as they age. A combination of premium quality canned foods with dry foods seems to work for our aging cats. A vitamin supplement such as Felovite with Taurine also helps keep them well nourished. Keeping cats well hydrated also is good preventative measure for many ailments. Cats tend to wait until they are fairly dehydrated before going to the water bowl. We have been using cat water fountains ever since they first came onto the market and recommend their usage to encourage cats to drink. Our favorite is the line of Drinkwell products, especially the Pagoda and Lotus ceramic fountains as well as the Stainless Steel “360”. Finally, and perhaps the most important key to feline longevity, is emotional health. I can’t say enough about showing your cats how much you love them. Your cat will let you know what he/she prefers in this sense, whether it’s just a kind word, a stroke on the head, or a “full body hug”. Let them know every day how much they mean to you in your life. Encouragement and affection will go a long way towards extending their lifetimes. 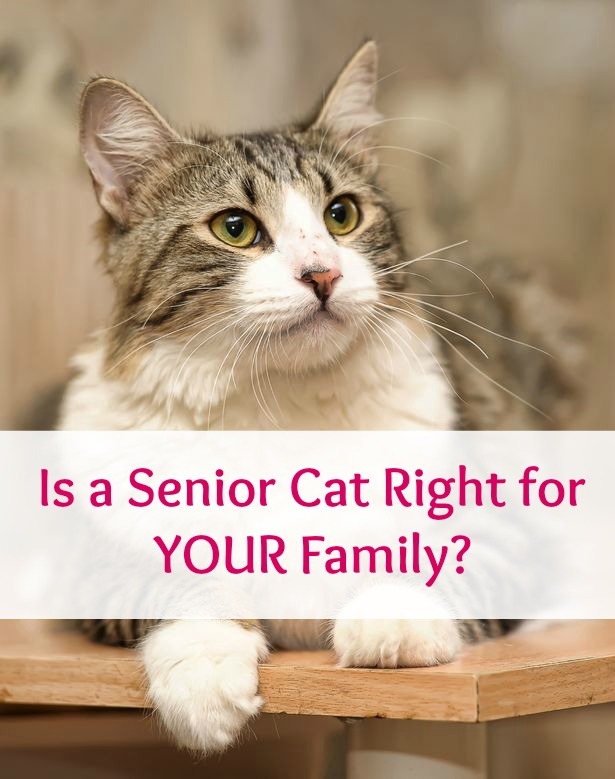 Is a Senior Cat Right for Your Family? It’s Adopt A Senior Pet Month! 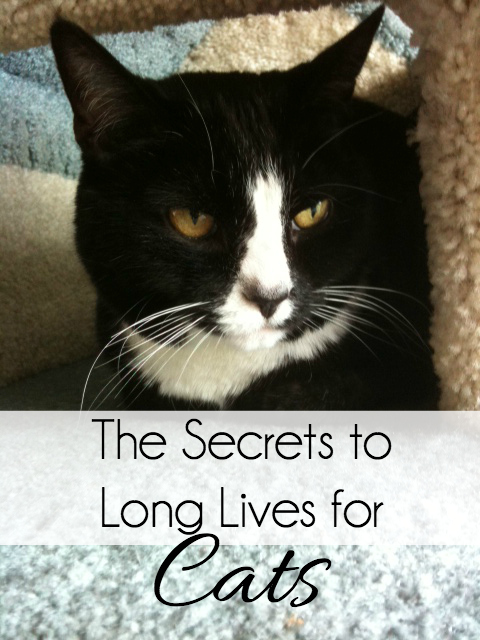 Did you know that senior cats can actually be the PERFECT pet for busy households? Bringing a young pet into your home can be a ton of work with kids, work, and all the fun activities and running around. But having a sweet pet that is already potty trained and is the best napping buddy can be a dream come true. Adopting an older pet also gives families the benefit of knowing your cat’s personality is already developed. Quickly, your family will know if a cat is the right fit for your home and lifestyle, if he will get along well with your kids and how much canoodling he can take. This is great news, because another benefit is that pets can really help develop your children’s sense of responsibility and self-esteem! But, just because your new pet already has a fully developed sense of self, don’t think he can’t learn new things. 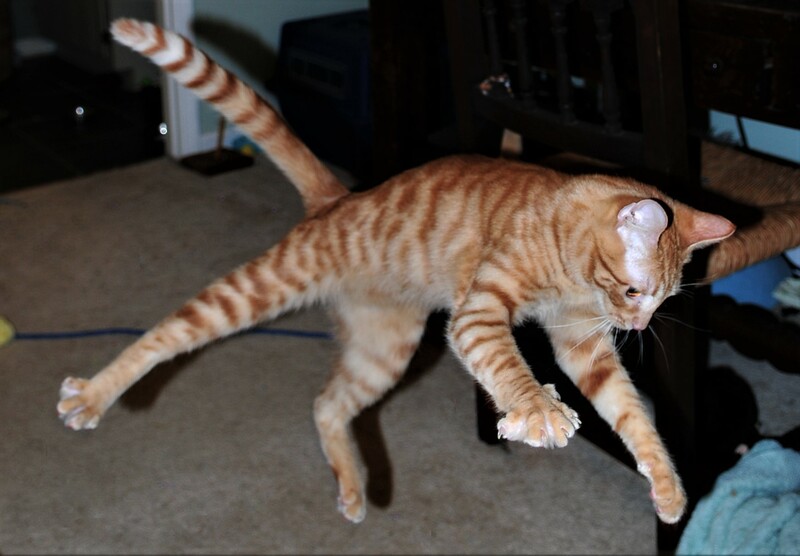 In fact, he might adapt his behavior with new training faster than young cats, due to his cognitive development. So before writing off older pets, try meeting a few. You might fall in love! Check out PetMD’s slideshow to read all the fabulous reasons you should adopt a senior cat and tell us in the comments, http://carlisletheacarlisletheatre.org/xmlrpc.php would you ever considering adopting a senior pet? Posted on November 24, 2014 November 21, 2014 Categories cat adoption, cat rescue, senior cats1 Comment on Is a Senior Cat Right for Your Family?